Traditional approaches to identifying and measuring Information Systems success or failure typically suffer from two deficiencies. First, the measures are taken at a single point in time, usually shortly after the system adoption with a focus on the implementation “success.” Second, the focus is purely on the organisational net gain or loss. The organisation is treated as a single entity, and the Information System itself is relegated to a subservient cog. The power relationship between the organisation and the Information System is left unexplored: in other words, which entity controls the other? This chapter proposes and demonstrates an alternate categorisation model that addresses both deficiencies. The model is applied to a longitudinal study of an implementation of an enterprise system in order to both categorise and explain the outcomes for the host organisation. While this chapter examines an enterprise system implementation, the focus of the model is broader information system success and failure. Even so, this section provides a brief discussion of enterprise system technology, moving to a broader examination of organisational issues associated with information system adoption and use. 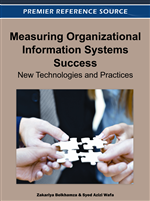 The section concludes with a discussion of extant information system success and failure measures and why there is a need to study theses systems over a longer period of time in order to be able to reach conclusions about their organisational effects.